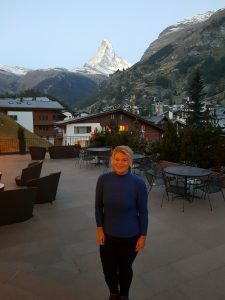 “I have just returned from an adventure in the Alps seeing some of the spectacular scenery and sights of Switzerland. 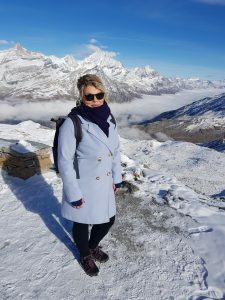 I was lucky enough to be hosted by one of our preferred tour operator partners Classic Collection holidays on a 3 night break, spending 1 night in famous Zermatt & 2 nights in the beautiful area of St Moritz. To get to our first stop of Zermatt & its famous Matterhorn mountain we flew into Zurich airport with Swiss Airlines direct from Manchester. 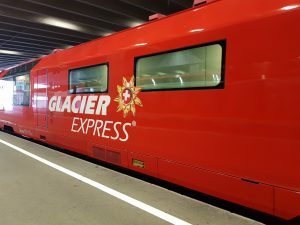 There is a train station at Zurich Airport so connections and travel from the airport are easy, frequent and most of the time run like clockwork! 3 hours 30 from Zurich airport via train and you arrive into beautiful Zermatt. It is a car free village so transport consists of electric buses, bikes and horse drawn carriages. 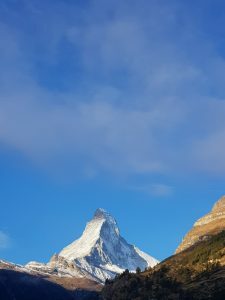 It is a perfect location to walk / hike with its famous peaks and the mountain train & cable cars give amazing views of the Matterhorn and surrounding areas. The old town is very pretty and full of flowers in front of the high street shops, designer boutiques and cafes. In Zermatt centre is the Gornergrat station where we joined the train up the mountains to the famous Gornergrat viewing area which is at an altitude of over 3000 metres. 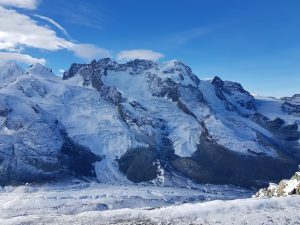 It is a 360 degree panoramic viewing area where you can enjoy sites of the Eiger, Monch & Jungfrau mountains as well as over 200 other peaks. On a clear day you may be able to see the Mont Blanc Massif in France or the German Black Forest. We were lucky with sunshine (if not very cold with ice and snow thickly layered on the grounds) and spent an hour admiring the beautiful scenery. Once back down in Zermatt we had a short walk across the road to the main station and moved onto Brig where we then boarded the famous Glacier Express train for the remaining 7 hours of our journey to St Moritz. 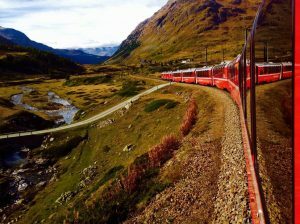 The Glacier Express train is the slowest express train in the world and travels through some of the most scenic parts of the country. You have panoramic windows where you can enjoy the views and the steady journey up & down the mountains. You can have the option of dinner on board the train which we did. If you are a fan of trains, spectacular views (or both!) then this is definitely for you. Arriving late evening into St Moritz we then moved onto our hotel for the remaining 2 nights. 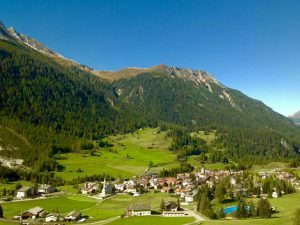 Set in the Albua Alps Region and at 1800 metres, St Moritz & the surrounding villages have been the centre of Swiss Alps tourism for years attracting royal families & celebrities. The resort is full of designer boutiques & excellent restaurants. The area is renowned for its winter sports but in the summer also offers great summer activities like hiking, cycling and also windsurfing / water sports of the areas famous lakes. 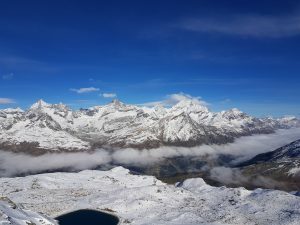 We did a full day excursion from St Moritz taking the train first of all to the Bernina Diavolezza base station where you then join the Diavolezza cable car and travel to 3000 metres to the Diavolezza peak viewing platform. Here you are rewarded with the magnificent views of the surrounding mountains & glaciers. Then once back down to base station we moved onto another train which took us over the Swiss border to the beautiful town of Tirano in Italy. Due to time restrictions we had a whistle stop 45 minute stay in Tirano but were treated to a gorgeous authentic Italian lunch at the Al Portici restaurant – a definite recommendation from me if you ever find yourself in Tirano! Leaving Tirano we joined the sister train of the Glacier Express which is the Bernina Express Train to take us from Tirano back to St Moritz. 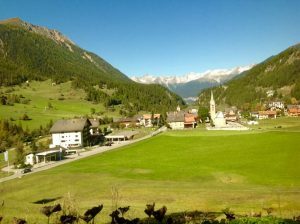 A beautiful 2 hours 30 minute journey was full of breath-taking views past waterfalls, ravines, mountain streams and over bridges & viaducts through the Engadine Valley. 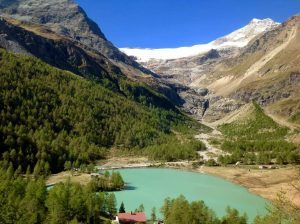 I must say out of all the train journeys we did the scenery on the Bernina Express journey topped them all – it really was just so pretty, you couldn’t put your camera down in case you missed the next beautiful site! After one last night back in St Moritz it was time to come home. A seamless service yet again on the Swiss trains and an easy 2 hour flight from Zurich back to Manchester completed my Swiss adventure. 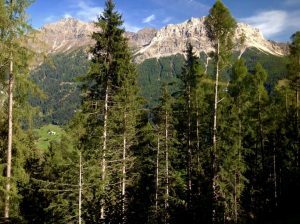 Having never been to Switzerland or its surrounding areas before I can see why it is so popular year round with summer walkers / hikers / scenery lovers and also through the winter for adventurers & skiers alike. It is a year round destination that has something for everyone – but if you are a lover of trains and beautiful scenery then this is definitely the place for you! I can’t wait to get my walking shoes back on and get there in the summer myself. Top tip – the fly luggage service used throughout the country is excellent and If you are going on excursions or a long journey for a day your big suitcase can be transported from one hotel to another for you so you don’t have to worry about moving that on & off a train – it can all be done for you! Error: Error validating access token: Session has expired on Monday, 01-Apr-19 06:23:33 PDT. The current time is Thursday, 25-Apr-19 22:42:12 PDT.